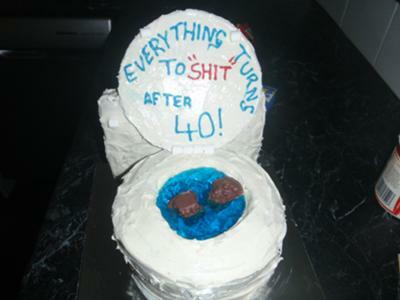 To make this 40th birthday ckae, I used 2 round cakes one on top of each other. I cut a hole through the top layer using a glass and then iced between the 2 cakes and on top and sides and in the hole with white icing. Then iced a slab cake and secured it to the back of the round cakes with tooth picks. I set jelly in a bowl roughly the size of the hole in the cake, then when almost set transferred it to the cake, put in the "poo" a picnic bar was used! I then cut out a round shape from some strong card, iced it and wrote on it then set it on the cake. Mini marshmallows were also used. OMG!!!!!!!!! I love it! I've been wanting to try one like this... yours turned out so cute!!!! I love it!